This luxury all-inclusive resort provides you with their unlimited passion experience. These Rooms are Located on the Front Portion of Both Buildings with Direct Ocean Views. Located on the north coast of the Dominican Republic on the stunning shores of Uvero Alto. 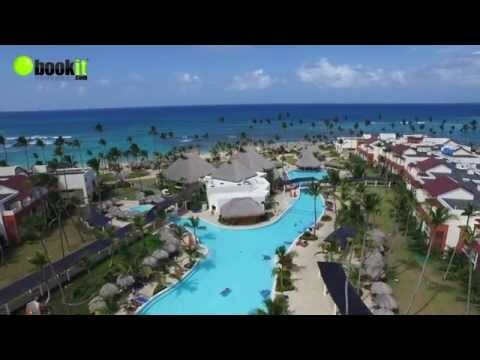 Approximately 35 miles (56 kilometers) from Punta Cana International Airport. The Best of Everything is Included at Breathless Resort and Spa, Experience their Spectacular Settings that Caters to the Sophisticated and Social Traveler. Breathless accommodations offers contemporary and traditional Caribbean decor of 750 guestrooms in two buildings, with whirlpools on every private terrace. The Xhale Club accommodations are located in both buildings and include the highest level of personal service and luxury and access to VIP areas throughout the resort. Breathless Punta Cana now welcomes small dogs (under 22 lbs. or 10 kg) in their accommodations and on property. This service is available for $65 USD per night, in specific room categories only. Only small dogs are permitted. Please contact reservations by emailing reservations1.brepc@breathlessresorts.com to check availability. Guidelines, restrictions and availability apply and are subject to change at any time. Breathless Punta Cana offers 11 gourmet dining options serving gourmet, trendy cuisine including eight a la carte restaurants, one buffet, a grill on the beach and a cafe. Eight Bars including Lounges. All restaurants openings rotate throughout the week. The number of restaurants open is dependent upon occupancy level. Breathless Sip and Saver Dining Experience: Indulge in unlimited gourmet dining and top-shelf spirits at nine chic dining venues serving International and fusion cuisine and nine vibrant bars and lounges to satisfy Guests every craving. Terms and Conditions: Sip Savor and See program is only available for dinner, and not a day pass to these resorts. Reservations Must Be Made at the Resort Concierge Desk by 3:00 P.M. This resort offers a large convention center to host small and large meetings, incentive events, seminars or any business purpose. Prices are subject to change without prior notice by the resort. Enjoy a golf package at Punta Blanca Golf or Cocotal Golf and Country Club or arrange an outing at 18-hole course La Cana, 18-hole course Catalonia Caribe Golf Club or 9-hole course Catalonia Cabeza de Toro, all with spectacular views. Please contact the concierge upon arrival to make tee time arrangements. The Punta Blanca golf course is an inland course built in the Punta Blanca residential development in Bavaro. Designed by Nick Price. Settled on what once was a coconut plantation, the six-time Spanish Champion Jose Pepe Gancedo designed two courses following the lay of the land. Late night fun, weekly shows to keep you celebrating all night long beginning at 11:00 P.M.
Close proximity to Altos de Chavn, Isla Saona and other points of interest in the Dominican Republic. 02 to 08 November 2019. 11 to 14 November 2019. 1. One complimentary room for every block of 5 rooms paid, not to exceed 3 total comp rooms for the group. Complimentary rooms are to be applied to the lowest total value room of any occupancy. For example: When booking five double rooms and one single room booked in the same room category, then the lowest total value room would be the single room and would be complimentary. 2. One complimentary upgrade will be provided to the next category for every block of 10 rooms paid for the average length of stay of the group; not to exceed 2 total upgrades for the group. Upgraded guest information must be provided to the hotel at least 30 days prior to arrival. The upgrade will apply to one room within the block of 10. 3. This promotion is not combinable with other groups promotions. Once the maximum number of rooms are met, any additional paying rooms are subject to Terms and Conditions, and parameters of the Group Policy (See Group Policy Tab 6). 4. This promotion is combinable with complimentary wedding packages, but only when the conditions of the complimentary wedding package are separately met outside the 3G room count. This means the required room category (varies by resort) needs to be booked for 7 nights, or 5 rooms in any category need to be booked for a minimum of 3 nights. The rooms booked counting towards the complimentary wedding package, cannot be counted as part of the rooms receiving the 3G promotion. For example if there is a wedding of 10 rooms, and the bride and groom book the required room category for 7 nights they can get the complimentary wedding package, and the other 9 rooms could qualify for 3G. Another example would be if there is a wedding group of 20 rooms for 3 nights, 5 rooms would apply for the complimentary wedding package, but then only 15 would be eligible for the 3G promotion meaning only 2 complimentary rooms would be obtained. It is the responsibility of the tour operator whenever requesting the 3G promotion for a wedding group to verify with the resorts wedding coordinator which package was confirmed by the couple. This is to ensure that the promotion is combined correctly. 6. A booking form will be issued by the resorts for every 3G booking and will indicate the complimentary and upgraded rooms. For groups of less than 10 rooms; FIT policies apply. 8. $200 in Coupons are broken down as such: three coupons worth $40 each, two coupons worth $20 each and four coupons worth $10 each. These coupons may be used only as follows: $100 for Spa treatment, $60 for romantic dining, and $40 for wine purchases. Spa treatment coupons are broken down in two coupons worth $40 and one coupon worth $20. Only one coupon can be redeemed per spa treatment. To use coupons for romantic dining, one $40 coupon and one $20 coupon may be combined, resulting in a total discount of $60 off one romantic dining experience. When using coupons towards wine purchases, only coupons worth $10 may be used and cannot be combined, therefore one $10 coupon can be applied toward one bottle of wine. 9. All rooms must be reported to hotel at least 30 days prior to arrival with the following necessary information provided: 1) Lead Pax Name, 2) Room Type, 3) Booking Date, 4) Arrival Date, 5) Duration, 6) Booking Number, 7) Room Rate, 8) 3G Group Name. 3G bookings will not be accepted without these requested details. 10. Any changes after 30 days must be reported immediately; no changes of any type are allowed past 7 days.